IEEE Women in Engineering (WIE) is one of the largest international professional organizations, that doesn’t just promote women engineers and scientists, but also inspire girls around the world to follow their academic interests in the male dominated arena of engineering and science. Connecting over 20 thousand members in over 70 countries of the world, IEEE WIE membership gives access to a global network that advances professional women in technology at all points in their life and career. IEEE WIE members make lifelong friendships, acquire influential mentors and make a difference for the benefit of humanity. WIE provides members with the opportunity to network at a local level through IEEE WIE affinity groups. 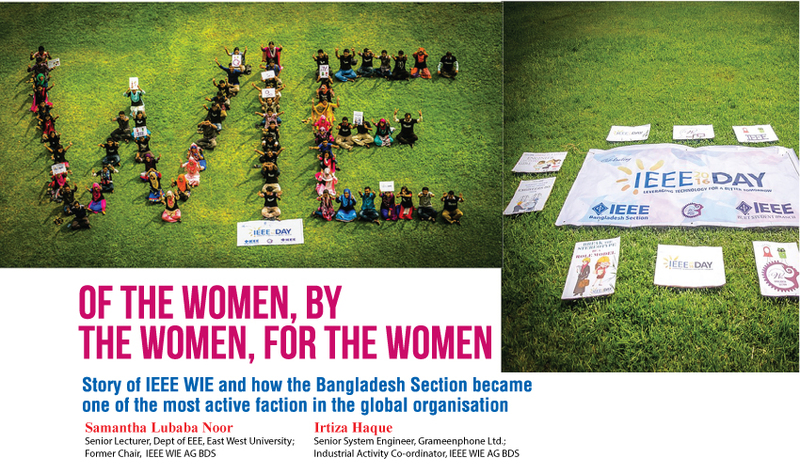 Currently, there are over 700 IEEE WIE Affinity Groups worldwide that organize and host diverse activities including guest speakers, workshops and seminars and IEEE WIE Affinity Group, Bangladesh Section is one of the most active affinity group among global WIE community by virtue of its diversified activities both in technical and non-technical fields. Starting its journey in 2011 as the first full calendar year with only 80 members, WIE AG, IEEE BDS, has now more than 10 Student branches and 800 members from both academic and professional fields throughout the country due to its vibrant activities. Among the numerous activities conducted by IEEE WIE AG BDS, organizing workshops to enhance technical skills on various software like Latex, Microsoft Illustrator and Proteus, PCB design, Web design, Robo Tutor etc, to name a few. Motivational talks by academician, corporate leaders and entrepreneurs also inspire the fresh graduates and current students greatly to build up networking and learn adaptability in this competitive world. Awareness raising programs like breast cancer awareness session, fire safety awareness session, technical problems solving contests for girls in Bangladesh etc express social commitment while the joy of womanhood is celebrated every year in the International Women Day. IEEE SYW Congress, IEEE R10 HTC WIE track, “Ladypreneurs! Let’s make an Entrepreneurial leap” etc are some of the remarkable events of 2017. WIE AG, IEEE BDS not only organizes seminars, workshops and motivational talks, but also contributes in the root level of society through various outreach programs. “Go Engineering Girl Campaign” is one of them focusing the young women of grade 1-12 and their parents. The vision of outreach programs is to introduce a student with the amazing engineering world as most of the parents want their girls to study arts and social science rather than engineering. The future plan includes engaging students with hands on activities and visiting research labs in order to make them familiar with engineering principles in action. 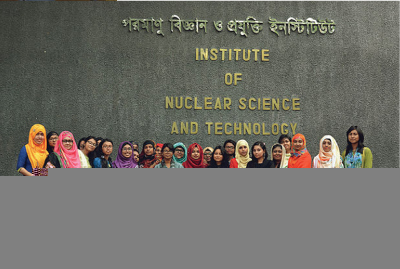 The group has also arranged three consecutive international conferences on electrical and elctronic engineering (WIECON ECE) starting from 2015 for bringing together individuals conducting research and professional activities in the area of ECE to share and present their latest innovation and findings. The Advisor and founding chair of IEEE WIE AG BDS, professor of EEE Department, BUET, Dr Celia Shahnaz expresses this vision exquisitely: “The introduction of successful IEEE women and narration of their stories on why they were inspired to become technical professionals, the difficulties in their work environment, their advice for young women volunteers interested in technical fields-creates a wide platform to discuss and exchange ideas and experiences among all, which definitely plays a great role in the development of the technical society around. Also the lesson that engineers can benefit humanity and make a difference are focused in the talks, research presentations, panel discussions, poster competitions and other activities, aiming to change the public’s perception of women engineers in academia and industry.